I once sat in a dinner party on a large round table across from a courteous fellow called David. The host was a physicist, Edgar C. who was honoring an author, a former secretary of the great Borges, so, except for the fellow David, everyone was dressed like people who read Borges. As to David, he was dressed like someone who didn’t know that people who read, among other such authors, Borges, needed to dress in a certain way when they congregated. At some point during the dinner he unexpectedly pulled an ice pick and made it go through his hand. I had no clue what the fellow did for a living –nor was I aware that Edgar was into magic as a side hobby. It turned out that David was a magician (his name is David Blaine), and that he was very famous. I knew very little about magicians, assumed it was all about optical illusions –the central inverse problem we mentioned in Chapter 1 that makes it easier to engineer than reverse-engineer. But something struck me at the end of the party. David was standing by the coat check using a handkerchief to sop us drops of blood coming out of his hand. So the fellow was really making an icepick go through his hand –with all the risks it entailed. He suddenly became another person in my eyes. He was now real. He took risks. He had skin in the game. I met him again a few months later and, as I tried to shake hands with him, noticed a scar where the icepick came out of his hand. This allowed me to finally figure out this business of the Trinity. 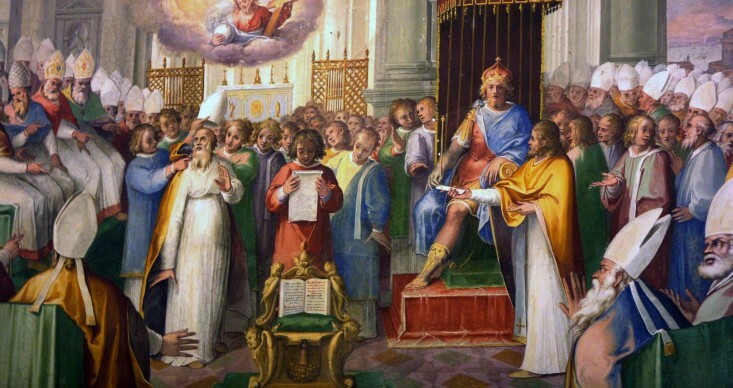 The Christian religion, throughout Chalcedon, Nicea, and other ecumenical councils and various synods of argumentative bishops, kept insisting on the dual nature of Jesus Christ. It would be theologically simpler if God were god and Jesus were man, just like another prophet, the way Islam views him, or the way Judaism views Abraham. But no, he had to be both man and god; the duality is so central it kept coming back though all manner of refinement: whether the duality allowed sharing the same substance (Orthodoxy), the same will (Monothelites), the same nature (Monophysites). The trinity is what caused other monotheists to see trace of polytheism in the Christian religion, and caused many Christians who fell into the hands of the Islamic State (ISIS) to be beheaded. So it appears that the church founders really wanted the Christ to have skin in the game; he did actually suffer on the cross, sacrifice himself, and experience death. He was a risk taker. More crucially to our story, he sacrificed himself for the sake of others. A god cannot have such skin in the game in such a manner, cannot really suffer (or, if he does, such a redefinition of a god injected with a human nature would back up our argument). A god who didn’t really suffer on the cross would be like a magician who performed an illusion, not someone who actually bled after sliding an icepick between his carpal bones. Philosophers, unlike the equally argumentative, but vastly more sophisticated bishops, don’t get the point with their experience machine. The machine is as follows. Simply, you sit in an apparatus and a technician plugs a few cables into your brain, after which you undergo an “experience”. You feel exactly as if an event took place, except that it all happened in virtual reality; it was all mental never physical. Alas, such an experience will never be in the same category as the real –only a modernistic academic philosopher who never took risk can believe that nonsense. Why? Our argument –that the real requires peril –can lead to niceties about the mind-body problem, but don’t tell your local philosopher. Now one may argue: once inside the machine, you may believe that you have skin in the game, and experience the pains and consequences as if you were living the actual harm. But this is once inside, not outside and there is no risk of irreversible harm, these things that linger and make time flow in one direction not the other. The reason a dream is not reality is that when you suddenly wake up from falling from a Chinese skyscraper, life continues and there is no absorbing barrier, the mathematical name for that irreversible state that we will discuss at length in Chapter x. Next let us consider the signaling benefits of overt flaws. I have a tendency to watch television with the sound off. When I saw Donald Trump in the Republican primary standing next to other candidates, I became certain he was going to win that stage of the process, no matter what he said or did. Actually, it was because he had visible, very visible, deficiencies. Because he was real and the public, composed of people who usually take risks, not the lifeless non-risktaking analysts we will discuss in the next chapter, would vote anytime for someone who actually bled after putting an icepick in his hand than someone who did not. Or Donald Trump was such a great actor that he should be performing in Greek tragedies. Arguments that President Trump is a failed entrepreneur, even if true, actually prop up the argument: you would even rather have a failed real person than a successful one, as blemishes, scars, and character flaws increase the distance between a human and a ghost. Αὐτὸς γὰρ ἐνηνθρώπησεν, ἵνα ἡμεῖς θεοποιηθῶμεν.